The Allen Township Fire Company's primary mission is to protect the lives and property of the residents of Allen Township, Northampton County, Pennsylvania from the affects of fire, accidents and man-made or natural disasters. In doing this the company must provide quality firefighters, training, and apparatus. 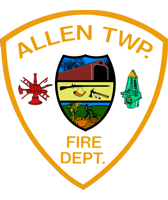 The Allen Township Fire Company will strive to the highest level in knowledge and new techniques when possible to improve the safety and well-been for the residents of Allen Township. It is important that the Allen Township Fire Company provides education to the public of fire prevention. The Allen Township Fire Company will also provide and receive protection from it surrounding neighboring fire companies to overall work as one team to ensure that the public is safe in Allen Township.